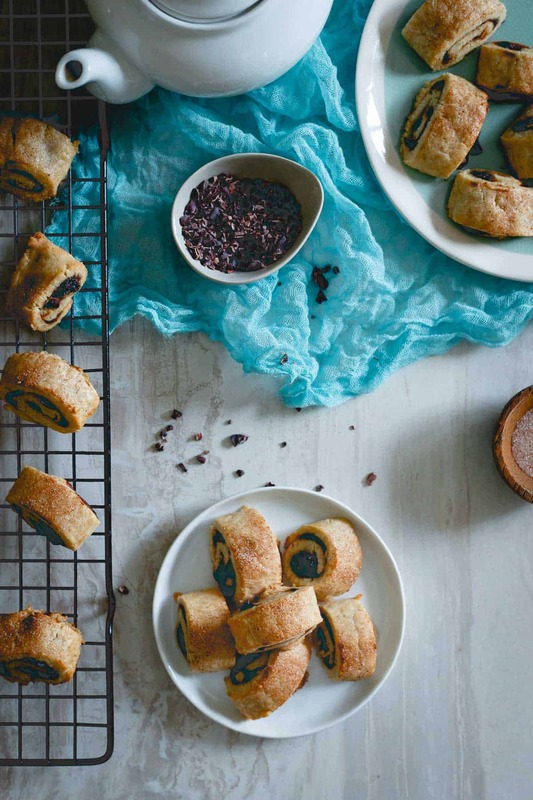 These gluten free apple butter rugelach are studded with cacao nibs for a crunchy bite. They’re buttery, soft and a fun cookie option for the season! I’m on a bit of a treats kick this week. 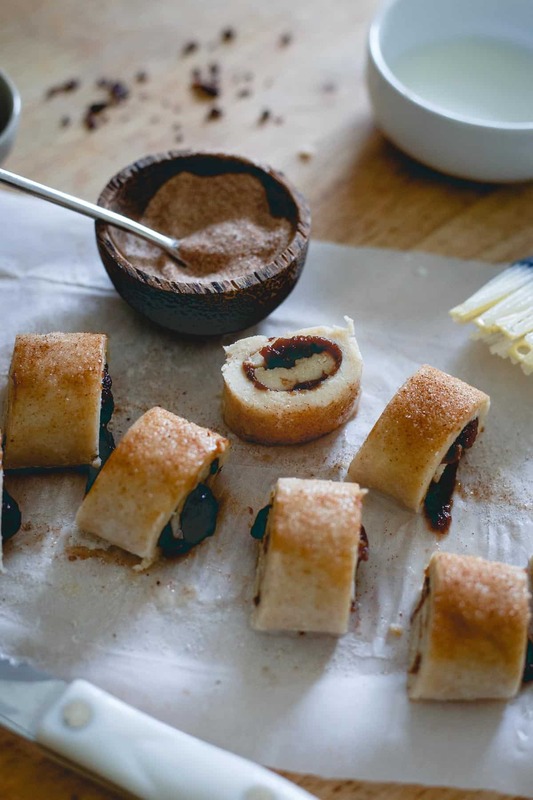 First, glazed orange cardamom cake and now apple butter rugelach but then again, who isn’t when it’s 4 days away from Christmas? This post is sponsored by Musselman’s. I’m also wishing I didn’t make these weeks ago and there were still some left on my counter because let’s just say someone had a few too many Manhattans at her husband’s work holiday party and could’ve really used the delicious buttery carbs from a few of these yesterday while incapacitated on the couch binge watching holiday movies on HBO GO. I forgot just how amazing Home Alone is/was and how epic Cindy Lou’s hair is in The Grinch. But back to these apple butter rugelach. 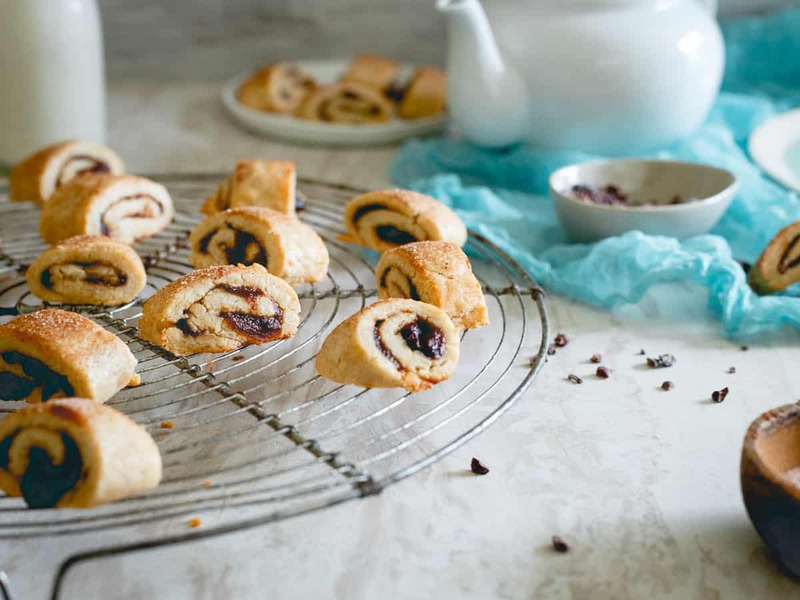 Rugelach were always on our dessert table during the holidays in my family. As a kid, I had zero idea they were 1. Jewish in origin (which totally makes me wonder why we always had them?) or 2. spelled like they are. In my head they were “roo-ga-la” and Italian like every other cookie on the table. I remember seeing the spelling for the first time and feeling like I was totally duped for all those years. Good news though, you don’t need to be able to spell them to enjoy their buttery, soft pillowy texture. I’ve had pretty much every kind of rugelach out there. You can do chocolate, nuts, seeds, dried fruit or fruit preserves/jams/jelly but my favorites were always the fruit filled ones. 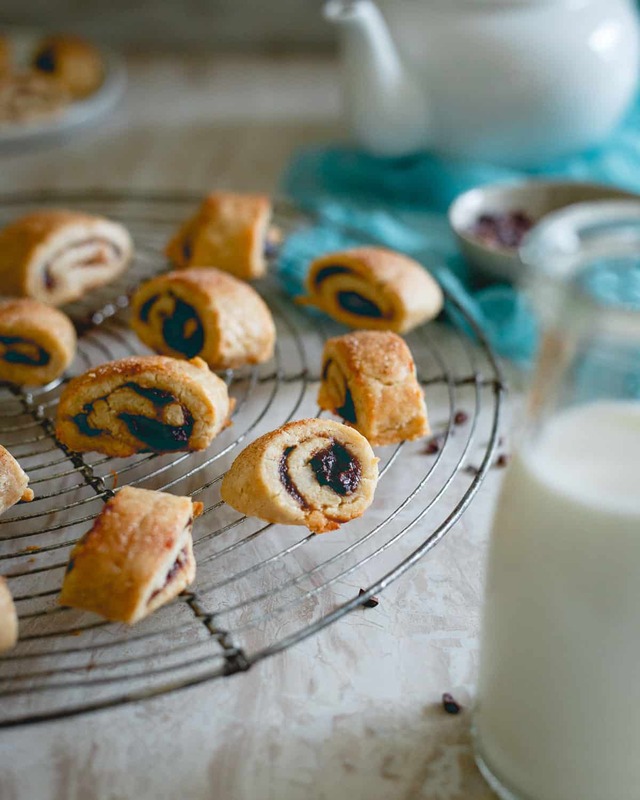 Just like I love a good fruit filled thumbprint cookie, fruit filled rugelach win me over too. Using Musselman’s apple butter gives these a seasonal twist making them perfect for holiday celebrations. The cacao nibs bring a nice crunch to each bite and the spiced sugar topping adds that perfect touch of sweetness to the otherwise incredibly buttery, cream cheese based cookie dough. These are gluten free too so everyone can enjoy them. With the amount of butter and cream cheese, you’d never even be able to tell! Try out these apple butter bacon scones or this apple butter carrot cake oatmeal for more apple butter inspired recipes. And definitely check out 10 ways to use apple butter for more sweet and savory options to enjoy this delicious condiment. 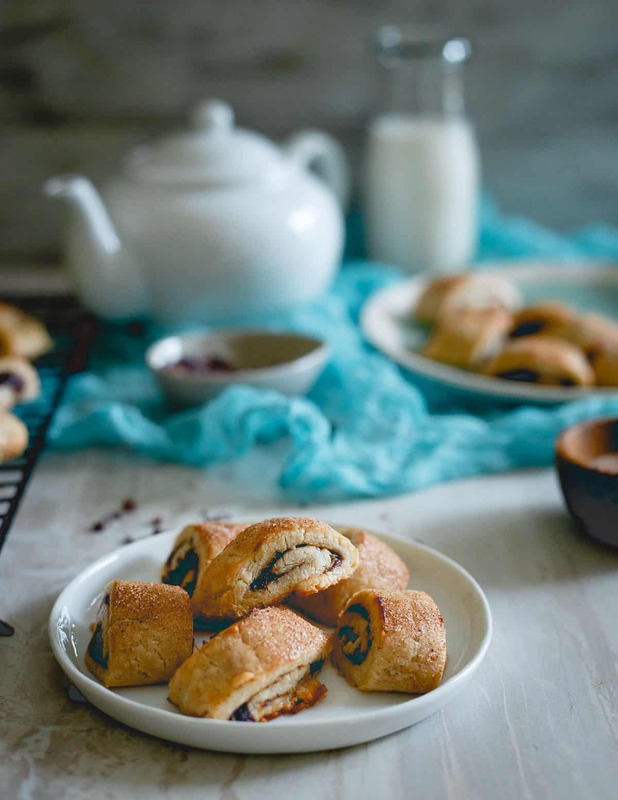 These gluten free apple butter rugelach are studded with cacao nibs for a crunchy bite. They're buttery, soft and a fun cookie option for the season! Combine the flour, 1 tablespoon sugar, ½ teaspoon cinnamon and salt in the bowl of a stand mixer fitted with the paddle attachment. Mix until just combined. Add the butter and cream cheese to the bowl and turn mixer on low speed. Mix until dough just comes together. Turn dough out onto a large piece of plastic wrap and form into a rectangular shape. Wrap the dough in the plastic wrap and refrigerate for at least 2 hours up to overnight. Remove dough from the refrigerator when ready to bake, cut into two even pieces. Roll each piece of dough into a 12”x4” rectangle between two pieces of parchment paper. Spoon ¼ cup of the apple butter onto each rectangle of dough and spread evenly leaving a border of about 1/3” of bare dough around the perimeter. 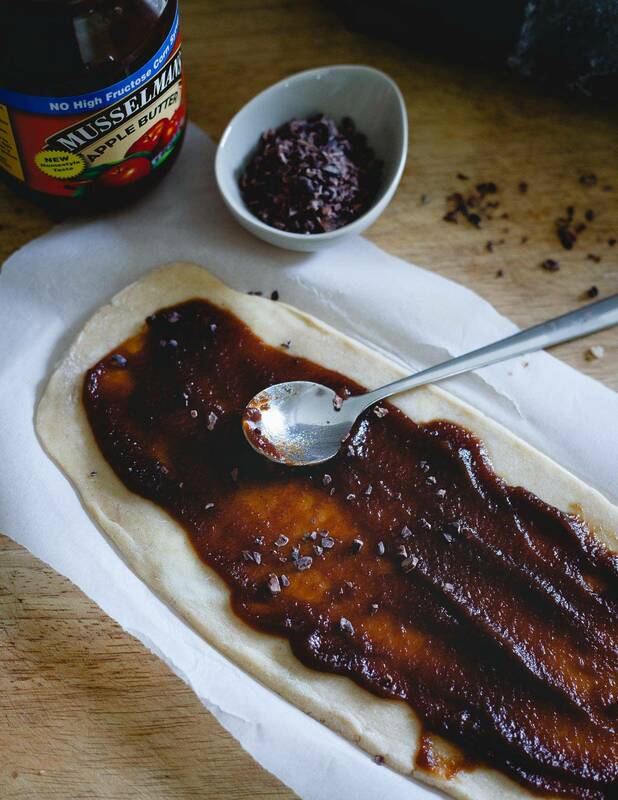 Sprinkle the cacao nibs evenly over the apple butter on each piece of dough. Roll the dough working with the long end and rolling towards you creating a 12” log. Place seam side down on parchment paper and chill in the freezer for 15 minutes. Combine remaining tablespoon sugar, remaining ¼ teaspoon cinnamon, nutmeg and cloves in a small bowl. 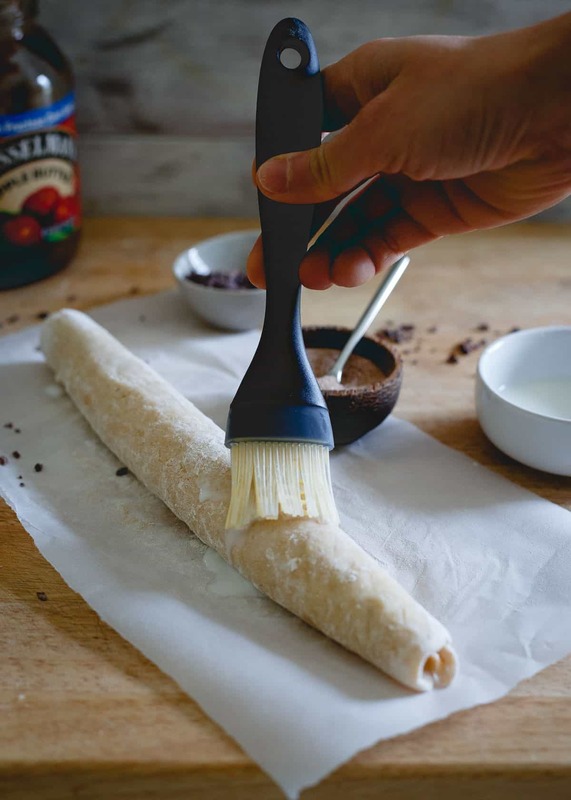 Remove dough from the freezer, brush each log with the milk then sprinkle evenly with the cinnamon sugar mixture. Cut into 1 inch pieces using a sharp knife and place seam side down on a parchment or silpat lined baking sheet. Bake for 20-22 minutes until golden brown around the edges. Transfer to a wire rack to cool and store in an airtight container. If you can't find cacao nibs, mini chocolate chips will work although they will melt unlike the cacao nibs so you won't have the same crunchy texture. Chopped nuts are also a great substitution. Pecans or walnuts would work nicely. Wow! this sounds so great! I love your use of apple butter! I love roo-ga-la too Gina! Love the apple butter/cacao nib filling in these! Perfect for the holidays! 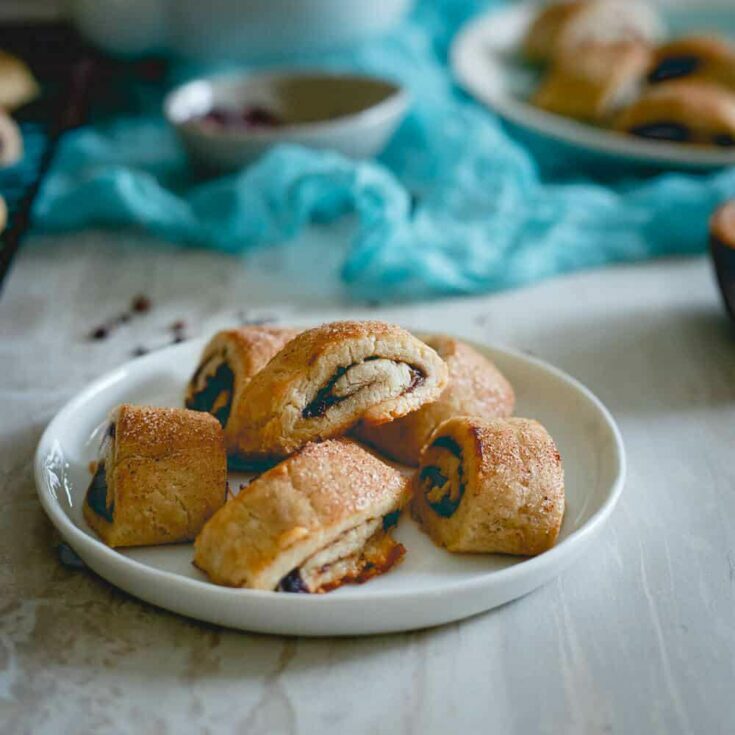 Rugelach is onenofnhis FAVES! Love this. That apple butter sounds incredible! Mmmm, these look perfect for the holidays! These are going to be delicious all year long! Can’t wait to make them with the Apple Butter! I have a package of cacao nibs in the cupboard. This sounds like a good way to use them up. Thanks! Whatever happened with the 1/4 cup softened cream cheese?? Thanks for catching that, recipe is updated to include the cream cheese!